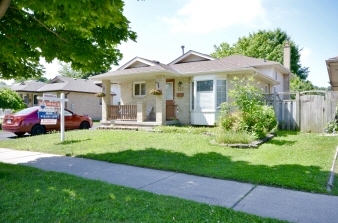 Welcome to this bright and spacious 4 Level Backsplit Home set on a treed lot and backing onto greenspace. This fine Family Home features traditional oak cabinetry & large Eating Area that is open to the fabulous Family Room. The Family Room is warmed by a cozy gas fireplace and as a bonus, you have direct access to the backyard. You'll notice the covered Patio which is ideal for BBQ's even when it's raining. The Upper Level was a 3 Bedroom plan that is now 2 very large Bedrooms that feature beautiful hardwood floors & could be easily returned to original design. The spacious Living Room/Dining Room combo is bright & features warm bamboo flooring, ideal for large family get togethers. The Lower Level includes a Games Room and Laundry facilities. For convenience there are 2 full Baths, central vac, ceramic tile in the Kitchen, built-in dishwasher & large shed with hydro. Also a roomy 1 car garage & spacious double drive with room for 4 cars.